CMCP420VT Loop Powered Vibration Transmitter Reliability Direct, Inc. Your Direct Source for Reliability, Maintenance, Test & Measurement! The CMCP420VT is a solid state, loop powered vibration transmitter. It provides a 4-20 mA output that is proportional to overall vibration in terms of velocity. The CMCP420VT continuously monitors machinery health and transmits directly into a PLC or DCS for trending, alarm and machine shutdown. 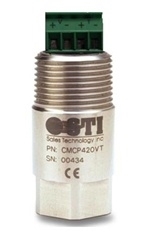 In addition, the CMCP420VT provides access to the dynamic transducer output. Portable data collector/analyzers can be utilized for detailed machine fault analysis.